Le Homme et la femme. Deuxième partie! This week I’m continuing on from what I talked about last week, specifically the evolution of the original chosen concept art. 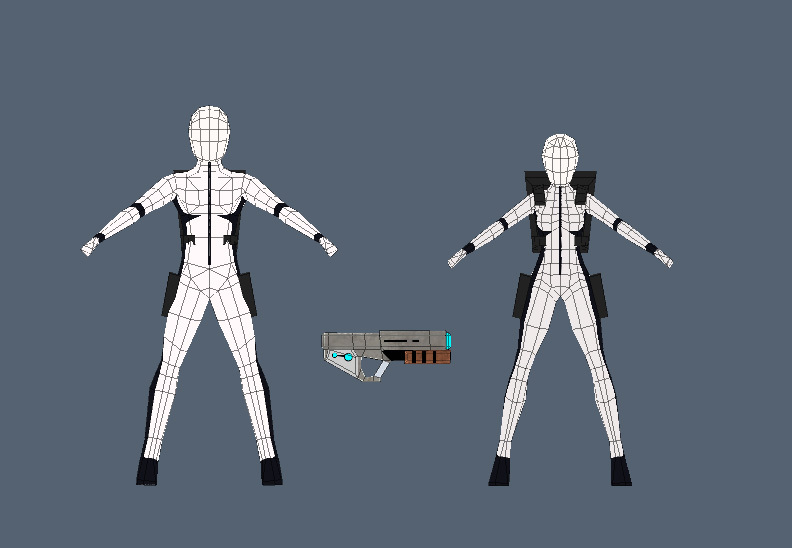 By the end of last week we had made the sculpt of the player characters, but still had a couple of issues to deal with. IF you forgot, or didn’t read, get on back in time and read it… or follow this link to that blog post. 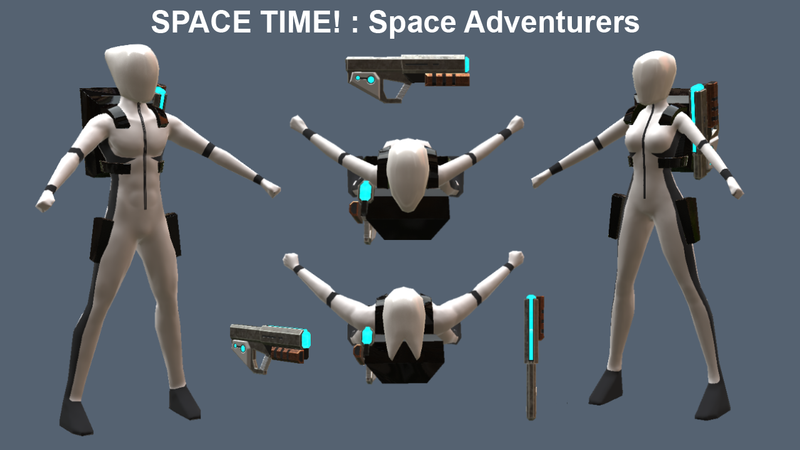 The most important design change that was left to visualise was the gun being too bulky when running around. This has now been redesigned to be a simple bullpup rifle that can fold in on it’s self. Here is a picture. Kept things simple detail wise because that is the style and keeping the poly counts down means I can have more things happening in general. So it’s a simple model that could be simpler if need be, and we’ll leave it at that. The characters are geometrically fairly simple also at around 600 polys. Both of them + guns +back packs are still under 2K polys. So stylised… or lazy. Whichever you fancy. One of the wonderful things about modern tech, is that there are a lot of fab tools which make doing simple things very quickly. Back in “The Day” I’d have spent a lot of time painting on shadows and the illusion of shape, but now, with modern per pixel lighting and normal maps, it’s usually better to trust the tech to do all that for you and leave well alone. The only downside of this is that the colour/diffuse/albedo texture doesn’t look very interesting in comparison to the fab painted textures of yesteryear which were works of art on their own. Nowadays we spend our time creating clever materials and then launching them onto the model with a magic spray can, so we end up with multi image uninteresting textures that we present like this. That is probably the only time you will see one of those from me because I don’t think they are worth anything except to acknowledge how many images make up a texture. On the other hand I do see the value in showing off a basic model in it’s standard pose. It’s not super shiny or covered by post processes, and is a good place to stop and think before trying the asset in game (and under game conditions rather than a fancy “In-Engine” production render). I’m not saying never do that, just that I am unlikely to. An artist will make a beautiful piece or art. I will make an asset for a game. The two things are not mutually exclusive, but they aren’t the same. I’m quite looking forward to getting back to the UK so I can get these peeps through Max and into the game for a proper test. 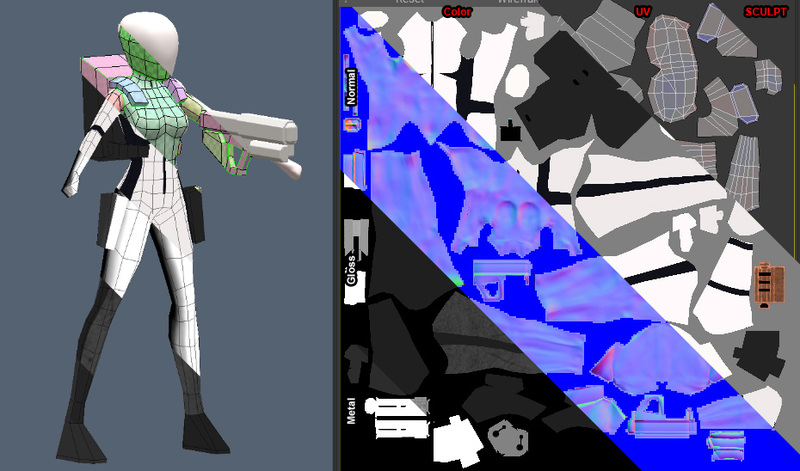 Perhaps the backpacks are still too large, and maybe the top view of the gun isn’t contrasting enough. We’ll only know for sure when it’s in. You can send me stuff on social media as usual ( Twitter, Facebook, and Youtube.) but you won’t get a reply this week since I’m not on them. Just sign up to everything @radiationburn related and nothing could possibly go wrong. Bye for now.